We know your daily coffee is one of the reasons you get up in the morning. Your favorite beverage, either hot or cold, offers you one of the most comforting feelings of your day. That is why we have designed a product that can offer a great quality coffee every day, but with a lower cost for your health, the environment and your pocket. We strive for simple living while surrounding ourselves with a higher quality of the products we use and consume. Your daily coffee doesn't have to be filled with mystery additives or cost hundreds of dollars a month. 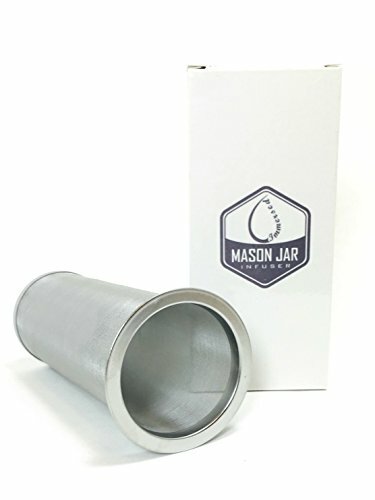 Rival any coffeehouse brew with our 150 micron mesh construction that allows coffee oils and complex flavors to circulate through the water while containing the grounds or tea leaves to be disposed of when optimal brew is reached! No more having to depend on wasteful filters, coffee cups or pods is a commitment for the environment, as well as a great way to save money! Coffee Explore bean regions, roast levels and infusing ingredients like agave nectar, cocoa or vanilla to add even more depth of flavor. Tea Try your own tea blends by adding healthy elements like dried or fresh fruits, hibiscus powders and dried flower petals. The filter makes brewing matcha and powders easy by infusing the flavors and benefits while sifting out the granules and clumps. Water Infusions are a delicious way to stay hydrated and absorb vitamins and minerals. Of course add any fruit, herb or veggie you like, but you can also try infusing mineral and coconut waters for added benefits. Liqueur Infuse wine and alcohols with gourmet flavors, or brew and funnel batches of coffee liqueurs or amarettos into unique bottles for gifting. SAVE MONEY Enjoy an ECO FRIENDLY coffeehouse quality brew without constantly purchasing expensive, wasteful disposable filters or plastic pods to throw out The 1 quart filter brews a 32 oz concentrate that is ideal for the office and on the go, or as an extra to have for experimenting with recipes- Jar not included. CUSTOMIZE YOUR BREW Take back control of your ingredients whether you prefer organic and healthy, or fair trade and eco-friendly, enjoy the satisfaction of knowing what you are drinking- Easily add ingredients like cinnamon sticks, vanilla beans, herbs or spices to your coffee or tea to infuse incredible flavor combinations. If you have any questions about this product by Immersed, contact us by completing and submitting the form below. If you are looking for a specif part number, please include it with your message.